Payroll tax reductions for lower income earners and introducing a new Financial Services Tax were two of the financial initiatives revealed as Finance Minister Bob Richards delivered the 2017 Budget in the House of Assembly this morning [Feb 24]. A copy of the full Budget statement is below, you can view our live blog on the Budget here, all our coverage of the 2017 Budget here, and s few highlights and the full speech is below. Pursuant to Government’s objective of diversifying its tax base, we are introducing a new tax to be called the Financial Services Tax which will be for banks, local insurance companies and Money Service Businesses. When applied to banks the tax will be calculated as 0.02% of assets. The tax as applied to local insurance companies will be a tax on gross premiums earned, excluding premiums from health insurance. The rate of tax will be 2.5% of non-health related gross premiums. 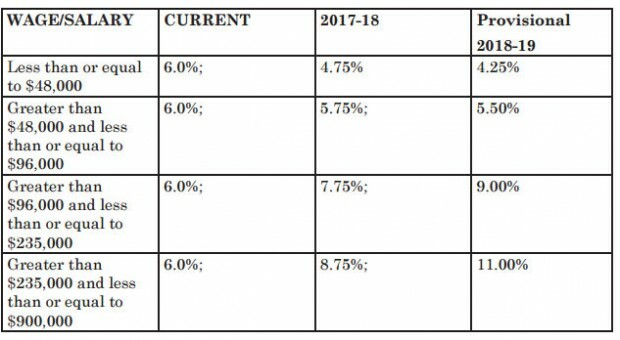 Finally the rate of tax for the Money Service Businesses will be 5% on their aggregated incoming and outgoing transmission volume. The duty on fuel will be raised by 5 cents per litre in April 2017 to achieve additional Customs revenue of about $5 million. In May and June Bermuda will host the 35th America’s Cup. In order to deliver on our contractual commitments and promises, the total Government budget for America’s Cup-related direct and indirect current expenses during the 2017/18 fiscal year is estimated at $31.8 million. Debt service costs for the 2017/18 Budget are projected at $186.1 million, 0.7% lower than the 2016/17 allocation of $187.4 million. This represents $124.0 million in interest payments and a $62.1 million contribution to the Sinking Fund. The estimates for 2017/18 indicate Government revenues of $1.042 billion, which is $45.4 million, or 4.6%, higher than the original estimate for the previous year. Government will have to incur new borrowing of $135 million to finance the 2017/18 deficit and as at March 31st 2018, it is estimated that gross public debt will stand at $2.629 billion, and debt, net of the Sinking Fund, will be $2.481 billion. the highlights of the 2017/18 Budget feature a 1.6% decrease in total expenditure of $19.0 million from last year’s budgeted figure. Revenues are forecast to rise by 4.6% or $45.4 million. The Current Account Balance, before debt service charges, is budgeted to be a surplus of $118.9 million. Payroll tax reform is also about introducing the principle of fairness into our system of taxation – a system that had become increasingly unfair to lower income earners. In effect, these reforms will require more from those who earn more and less from those who earn less. This is what we mean by progressive reform. The current structure has always been unfair to lower income employees, as the flat rate structure imposed an unfair heavy burden on lower income employees compared to their higher earning counterparts. The above is the marginal tax rate schedule for our reform. 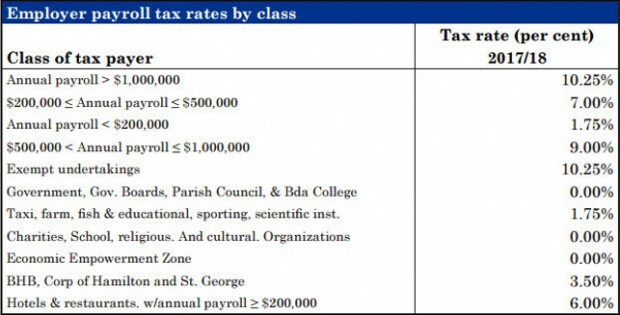 It illustrates the rate at which various levels of income are taxed. As income rises, each dollar of income above the previous level is taxed at a higher rate. In recognition of the difficulty many people have experienced during this period of adjustment, Government is seeking to give tax relief mainly to the two lowest bands of wage ranges stipulated by the Department of Statistics. This is the most important part of payroll tax reform and is the part that results in an increase in take home pay for people who earn less than $137,143 p.a. Over three quarters of the population earn below $137,143 and should benefit from a reduction of the employee’s portion of the Payroll Tax. Therefore in the situation where an employer is currently passing on the maximum amount of 6% to an employee, an employee earning in the lowest band (1) will receive a tax cut of up to $600 p.a. in 2017/18. The next band (2) provides for a tax cut of $600 – $720. Band three provides for a tax decrease of $720 to an increase of $1,713. The top band provides for an increase of $1,713 to $29,000. Employment tax on employers will also be affected using the same approach, i.e. having the tax burden falling more on larger companies than on small business. Bernews, you are so on the ball. Got all this Budget stuff up so quick. Bravo!